Basic summary: A lightweight long-inseam shorts option to keep you simultaneously covered and cool, designed to wick and shed moisture quickly in warm conditions. 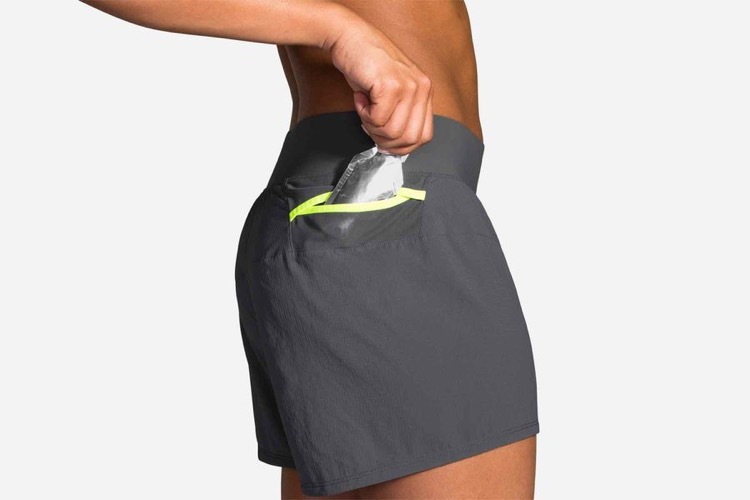 Two small pockets provide a bit of external storage on either hip, with an internal key pouch inside the back hip. The Cascadia line is Brooks’ longstanding trail running collection designed in collaboration with Scott Jurek. While the shoe collection is now on its 12th generation, the apparel offshoots are a newer addition, built specifically with trail adventures in mind. They are also something of a throwback, in that it’s getting more difficult to find a longer inseam short that doesn’t have a boxer brief lining – instead, the Cascadias use a classic brief liner that rides comfortably, wicks effectively, and keeps everything in place. 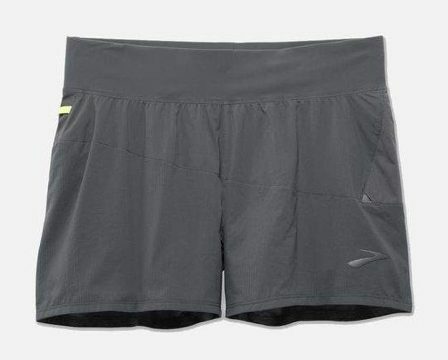 Taller runners will appreciate the extra thigh coverage, and the fabric construction is so light that the shorts stay cool even on super-hot summer days. 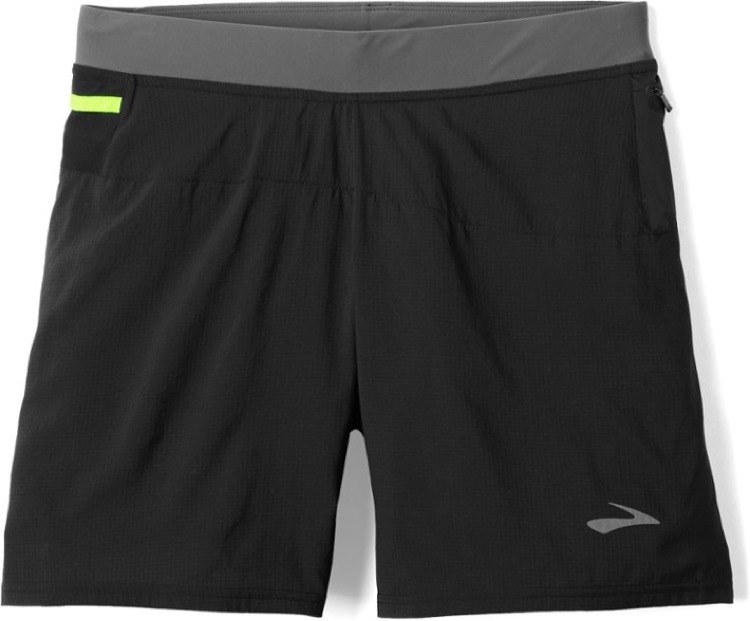 Although the fabrics are not billed as odor resistant, we were able to run in the these shorts for a few consecutive days without too much of a stink problem. The external panels are quite thin and soft, but made of a durable ripstop material that resists snags well, and has a very subtle waffle grid weave to allow increased airflow from the skin through the panels. Even in humid conditions, these shorts don’t cling to the skin with prolonged sweat or water so dry very quickly after river immersion, thanks to their lightweight construction and rapid-wicking DriLayer fabric. A wide waistband sits comfortably against the skin, but has very little elasticity to it. We found the sizing to be slightly large, so you definitely need to secure the drawstring to keep the Cascadias in place. The drawstring sits in the middle of the waistband, so you have to dig down for it just a bit for on-the-fly adjustments, but it’s an easy accommodation to make. Storage on the Cascadia shorts is basic, with one external stash pouch on the right hip, and a secure zipper pocket on the left. The zipper pocket has a moisture-resistant interior lining, so it’s perfect for a credit card or even a small phone. There is a small stash pocket in the rear of the brief liner, which is difficult to access but a nice option for tucking a key away until the run is over. The Brooks Cascadia shorts are available in men’s and women’s versions from www.brooksrunning.com and other online retailers.